This vehicle was seized as a result of the recent incident. FISHERIES officers in Victoria recently responded to a 13FISH call regarding the taking of undersized snapper at Lorimer Street in Port Melbourne. Two officers spoke with a 21-year-old man from Meadow Heights, a 20-year-old man from Broadmeadows and two other males yet to be identified, after which officers attempted to inspect their vehicle. As officers approached the vehicle, one of the males was allegedly observed loading a number of fishing items into the back of the vehicle and locking the canopy shut. This man then got into the drivers seat and started the vehicle, waiting briefly to let the other three men jump in. Fisheries Officers have the power to stop and search any vehicle. After repeatedly requesting the vehicle be turned off, one officer reached into the open driver’s door and turned the vehicle off. The driver then allegedly left his vehicle and spear tackled the fisheries officer. This offence carries a fine of up to $19,320 and/or 12 months imprisonment. The Fisheries Officers then attempted to tactically withdraw, telling the males to stop or they would be sprayed with pepper spray. The officers attempted to back away as three of the men kept advancing in a threatening manner. One of the accused allegedly began swinging his fists as though preparing to strike an officer. Both officers gave a final warning that they’d deploy their pepper spray, as which point all four men ran back and entered the vehicle and fled the scene. 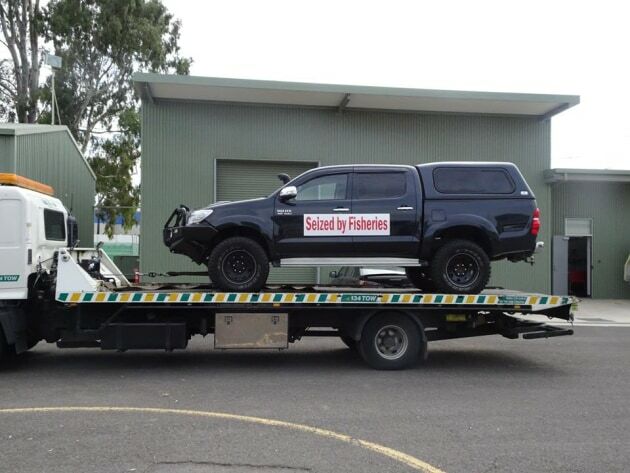 The following week, Fisheries Officers accompanied by police attended a location in Broadmeadows and seized the driver’s vehicle. The two identified men will be charged on summons with failure to stop on demand, failing to adhere to lawful direction from a Fisheries Officer, assaulting Fisheries Officers and threatening Fisheries Officers in their line of duty. Investigations are ongoing and the Victorian Fisheries Authority hope to identify the other two men shortly. Anyone with information regarding this incident, or other illegal fishing activity, is urged to call 13FISH (13 3474).